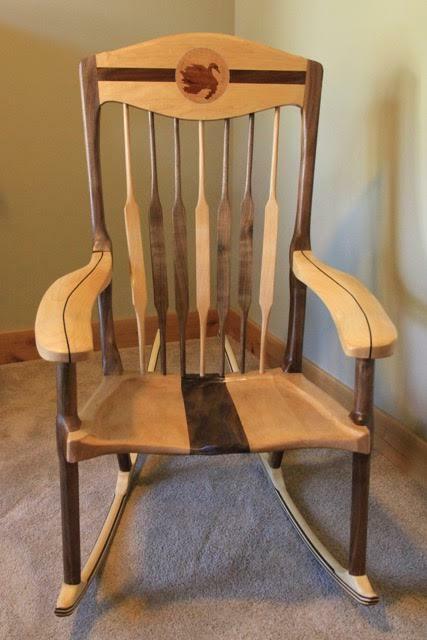 The following 2 pieces of furniture have been made by the master furniture builder Gerry Thomas. 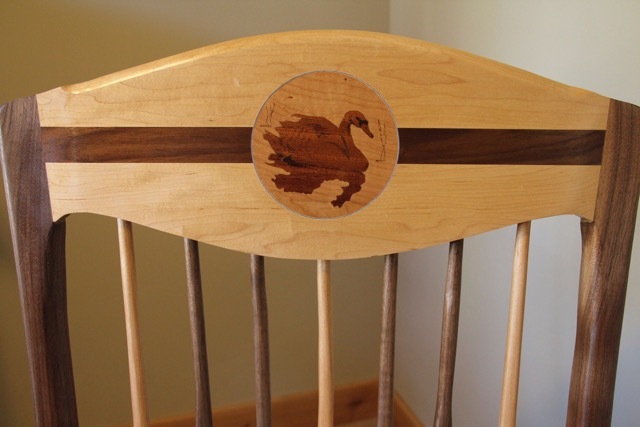 Both the rocking chair and the wine table are exquisitely crafted, featuring marquetry swans. The artist has named these pieces “The Sentinels of the Lake.” Both will be available for bidding at this year’s benefit auction on October 12th, and may be bought together or separately. All of the proceeds will go to the FACES Foundation. 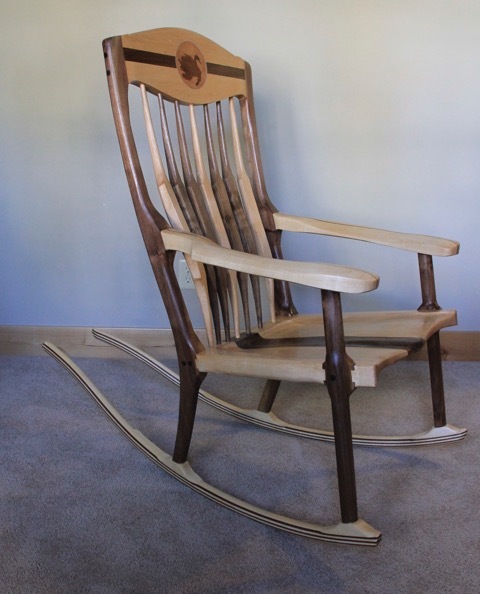 The Sentinels of the Lake rocking chair and wine service table were created as a set but can be auctioned individually if preferred. The title, of course, refers to the pair of marquetry swans: the one with the ruffled wings being male, or yang; the more delicate and graceful one being female, or yin. The title was suggested to me from a short story I wrote a number of years ago and recently revisited in which a mated pair of swans are characterized as being soul mates. The thought occurred to me, why not commemorate these beautiful birds in a furniture set? 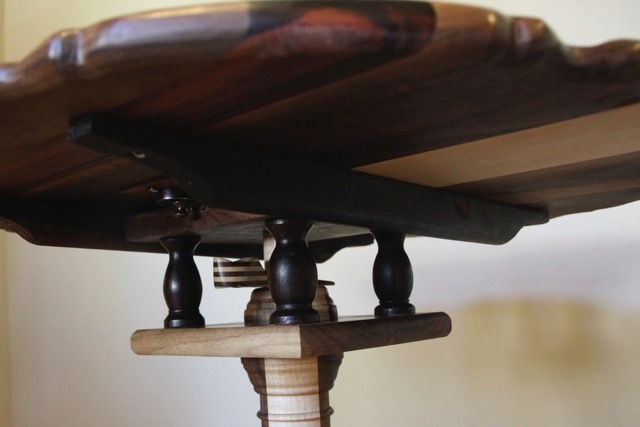 Both pieces are made from maple and walnut but contain elements of rosewood and ebony. Elizabeth, my wife, suggested that the ebony lines in the arms of the chair would appear to gently embrace whoever might be the chair’s occupant. I really liked that image, as well as regarding the swans as representatives of yin and yang (another suggestion of Elizabeth’s). It goes hand in hand with the juxtaposition of the light and dark woods and with the idea of soul mates. 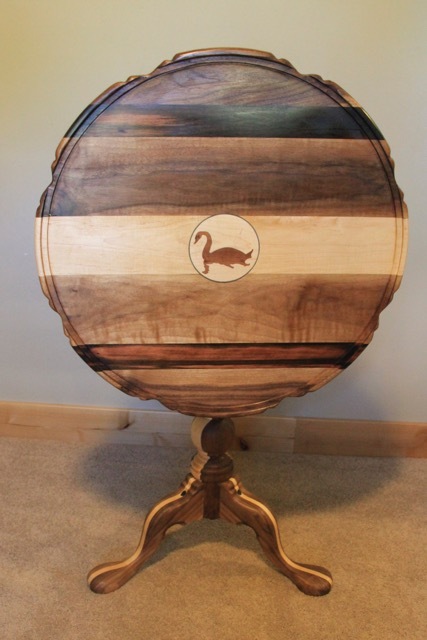 The pie crust table has several unique features. The top can be positioned to be either flat or vertical. When placed in the flat position the top will rotate much as a Lazy Susan, or it can be held in a stationary position by a key. As a sidelight, the key was fashioned to match the design of the chair rockers. 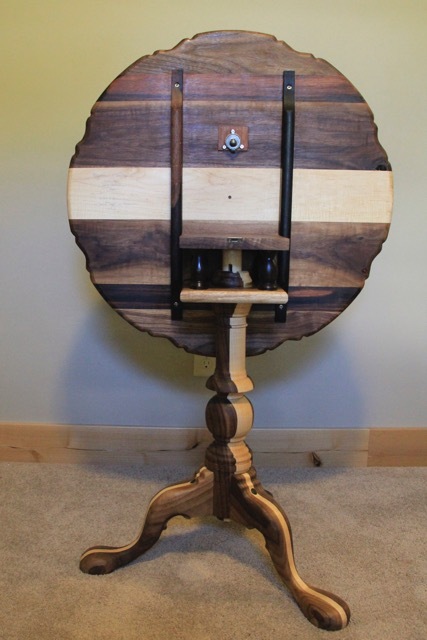 The design of the table is an old one dating to the early 1700’s when drinking exotic teas became the rage in Europe. However, I thought it would be more fun to utilize the table for serving wine. Both pieces were constructed with great care and attention to detail. They are sturdy but at the same time, delicate. So of course they are meant to be used but hopefully will be regarded and treated as objects of art as well. It is my wish that whoever uses them will be embraced with love and peace.